A Memorandum of Understanding (MoU) was signed between the Indian Army and State Bank of India (SBI) on the Defence Salary Package on 23 Feb 2015. The signing in ceremony was chaired by the Adjutant General, Lt Gen Rakesh Sharma and was attended by top dignitaries of SBI Bank, headed by Dr Vaidyan MG, Dy MD (Retail Strategy). The first MoU between SBI and the Indian Army was signed in 2011 and was valid for a period of three years. The revised MoU is tailor-made to suit the requirements of serving soldiers, pensioners and families. A number of additional facilities have been incorporated in the revised MoU after concerted efforts spanning over a year. The basic features of the MoU include a number of free / concessional services like free drafts, free cheque books, free funds transfers to any bank in India through RTGS / NEFT, free ATM cards etc. The provision also includes the Nepal Express Remittance Scheme which enables instant fund transfers to Nepal for the benefit of the Nepali Domicile Gorkha Soldiers serving in the Indian Army. Additional improved features are linking of the Personal Accident Insurance (PAI) to the Savings account instead of the debit card, enhancement of the PAI amounts, enhancement of the exemption percentage of margin money for house and car loans and waiving off of the processing charges on the loans. The revised MoU will benefit almost 19.5 lakh pensioners and 10 lakh serving personnel who hold Pay or Pension accounts with SBI and also provide them an opportunity to access modern banking facilities. 2. Reimbursement to beneficiaries/ empanelled hospitals shall be limited to ceiling rate or as per actuals, whichever is lower. The other terms and conditions as regards to CGHS package rates remain unchanged. Of late there has been a flurry of emails on OROP. Seeing that it affects all of us, the interest OROP has generated is fully understandable. OROP started its journey in the early Nineteen-Eighties. Since then many had been pursuing it. Notable among them is senior Veteran Col Inderjit Singh, who has been doggedly chipping away at the government resistance and pushing for OROP in his quiet dignified way. He would be remembered with great admiration by the future generations. From 2008 onwards, the IESM put fresh fuel in the fight for OROP. Ours was a mix of presentations and protests, of meetings, memoranda and medal deposits running simultaneously; pressure and persuasion. Meetings also took place with various political leaders. This included Mr LK Advani, Mr Rajnath Singh when he was BJP President, Mr Nitin Gadkari, Ms Sushman Swaraj, Ms Supriya Sule and many others. The Rajya Sabha Petitions Committee, which itself was the result of efforts by the MP, Mr Chandrashekhar, came as a shot in the arm. Among others the IESM delegation too made a presentation to the Committee. Some of us also worked behind the scenes. A couple of meetings at the residence of Shri Bhagat Singh Koshyari, who was heading the Committee, helped in inserting the crucial clause that future pension enhancements should be automatically passed on to the past pensioners. As would be seen, with this provision instead of being a one-time benefit, OROP becomes a permanent feature for pension equation. It is a boon for future pensioners. We also had a few meetings with an influential Committee member Mr Ram Vila Paswan and succeeded in soliciting his support. The cumulative effect of all these efforts resulted in OROP being announced in the Parliament on 17 Feb 2014. Interaction with Mr AK Antony further ensured that this clause - of future enhancements being given automatically to past pensioners - was inserted in the Note he issued in the fourth week of February 2014. This definition was also later reiterated by the RRM in the Parliament in November 2014. Ever since February 2014, OROP has been only a question of 'when' and not of 'whether' it would come through. The bureaucratic hurdles were indeed there. First they wanted 'service in the rank' and not 'total service' as the criterion. This was adequately explained to the RRM and he confirmed that he would overrule the bureaucrats; he did. The second resistance was in the form of a perceived administrative difficulty in implementing the frequent enhancement in pensions. This was again explained to the RRM that pensions could be enhanced once a year and that since the Dearness Allowance was already being enhanced twice a year in the case of all pensioners without any difficulty any apprehension in case of pension is unfounded. 1. The definition, as given by the Koshyari Committee stays unchanged. 2. The existing 'X' and 'Y' Groups would continue. The Service Headquarters had wanted merging of the Groups to 'X' level but the recommendation was not accepted. "Keeping the above parameters in mind, a model is suggested here. Let us take the rank of Havildar. The base date of implementing OROP being 1 April 2014, take a sample of the total number of Havildars that retired in the preceding few months or an year. Take the highest pension earned by any Havildar during this period and use that as a benchmark for fixing pension of all Havildars. Since they all retire after a total service of 24 years, the application is simple. In the case of officers, since they retire by age, and the total service varies, take the maximum earned in the chosen sample for different lengths of total service and use these as benchmarks in a similar manner." 4. At the time of preparing tables, Majors' pension is proposed to be upgraded to Lt Col less the Grade Pay equivalent. 5. The total estimated annual cost of OROP is Rs 8,200 Crore. There are several anxious and even impatient calls being received daily where ESM keep asking for the progress on OROP. The Defence Minister in his TV interview had stated that OROP would be implemented by 31 March 2015. There is no change to that timeline. Some queries even pertain to the budget allocation, which should not be our worry/concern at all. A patient wait is required. As would be expected in any democracy, departments concerned or dealing with the Armed Forces of most nations strongly stand behind their men and women in uniform and plead for the best of benefits from their respective governments. But in our country, the Ministry of Defence (MoD), till recently, was legendary in always taking an adversarial stand against the profession of arms. And not straying from this dubious legacy, it were elements of the same Ministry that always opposed the grant of OROP to military veterans repeatedly citing financial, administrative and legal impediments for resisting the concept, and in the bargain, attempting not only to mislead and misguide the highest of political executive, but even Parliamentary Committees. While financial constraints are well understood and appreciated, there is never too high a price to pay for those who protect us at the peril of their lives. Under the garb of administrative constraints, it was pointed out by the Department of Ex-Servicemen Welfare (DESW) of the MoD to a Parliamentary Committee in 2011 (Koshyari Committee) that OROP was not feasible to implement since documents of military personnel are weeded out after 25 years- an incorrect averment, to say the least. In reality, it is the documents of non-pensioners that are weeded out in 25 years as per Regulation 595 of the Regulations for the Army. 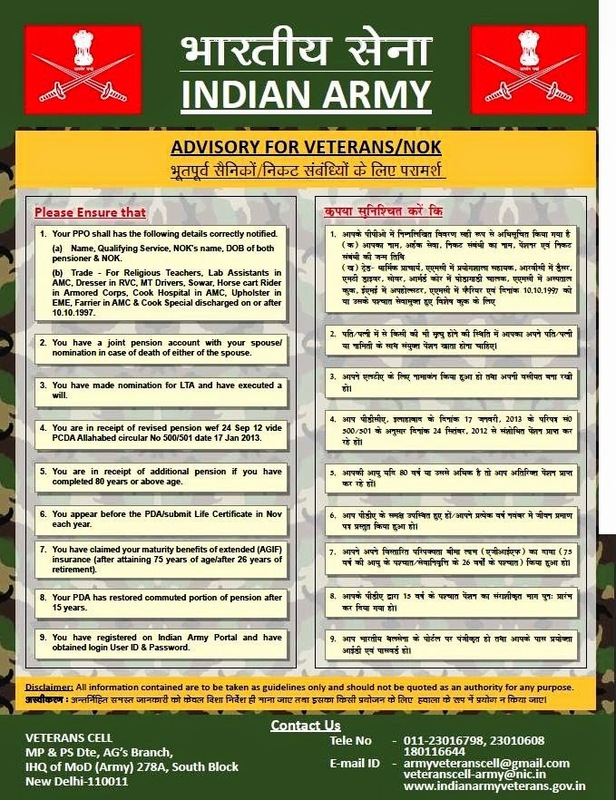 Moreover, the Pension Payment Orders (PPOs) of pensioners which contain all relevant details such as the rank last held and the length of service are retained during the lifetime of each pensioner and then during the lifetime of the family pensioner in case of demise of the former, and these details, which are the only two basic requirements for OROP, are also available in a document called “Long Roll”which is maintained in perpetuity in terms of Regulation 592 of the Regulations for the Army. Of course, a complaint to the then Raksha Mantri related to false statements by representatives of the MoD to the Parliamentary Committee and also to Constitutional Courts did not elicit any action whatsoever, as expected. Even the legal constraints pointed out by the DESW repeatedly hold no ground since the decision of the Supreme Court in the case of Maj Gen SPS Vains, being the latest on the subject, fully endorses the concept of OROP. Another strange bogey historically put across by the establishment has been the imaginary fear that “other employees” would also start demanding OROP. This argument too is faulty at multiple levels. Firstly, it is a fact that no civilian pensioners’body has ever opposed additional pensionary benefits to military veterans and mostly civilian peers have supported the cause, tacitly and even overtly. Secondly, unique service conditions such as living away from the family in a strictly regimented, at times hazardous and highly stressful environment, maintaining two households on being posted away from family, being under a disciplinary code 24 hours a day, 365 days a year et al make an additional dispensation such as OROP all the more justified. Thirdly, depending upon rank, soldiers start retiring at the age of 34 which is not the case in any other service including comrades of the Central Armed Police Forces who also no doubt face tough service conditions. Fourthly, civil employees are blessed with a much higher lifetime earning as compared to military employees and they also are fortunate to see multiple salary revisions through subsequent pay commissions. Fifthly, a much higher system of calculating pensions remained applicable to the defence services till the third pay commission when it was abruptly discontinued and military pensioners were suddenly (broadly) equated with civilian pensioners in many aspects. Sixthly, the fear of ‘similar demands’ also now does not hold much water since other employees (post-2004) are on a New (Contributory) Pension Scheme which is much different than the traditional pension system of the Government. Seventhly, contrary to popular perception, and interestingly, the average life expectancy of military personnel and veterans is much lower than other civilian employees, especially at the lower ranks. Per chance, co-extensive with the proactive top brass in the government, the higher echelons of the military have also seen some changes including the newly appointed Adjutant General of the Army who is expected to make a change with his sensitive and pragmatic approach. It is a perfect opportunity for the defence services to work in tandem with the government to ameliorate the problems being faced by the veteran community. The fillip to the Veterans’ Cell in the Army HQ, which is rendering excellent service, is a step in the right direction. It would in fact augur well for the system, if just like the DESW, the military too cleans up its act especially in its Personnel Services directorate and Record Offices, the elements of which are also ensconced in cobwebs of negativity and rigidity and who do not let the seniors in the chain of command look at issues with an optimistic vision. File notings are framed in such a manner so as to ensure the elicitation of a negative decision. This attitude must change, so must the structure of initiating multiple litigation by the establishment against old veterans, disabled soldiers and military widows. Military veteran organisations too must not take extreme positions or bicker amongst themselves. In fact, the veteran community expects veteran organisations to play a beneficial role and facilitate a well oiled overall veteran welfare machinery, bereft of politics. A soldier, discharged from service due to some disease, cannot be asked to prove he suffered the ailment because of military service to be eligible for disability pension, the Supreme Court has ruled. It said the government has to give disability pension to a discharged soldier as he was fit at the time of his induction in armed forces and it is presumed that he suffered from ailments only because of his job. “A soldier cannot be asked to prove that the disease was contracted by him on account of military service or was aggravated by the same.The very fact that he was, upon proper physical and other tests, found fit to serve in the Army should rise as indeed the rules do provide for a presumption that he was dis ease-free at the time of his entry into service. That presumption continues till it is proved by the employer that the disease was neither attributable to nor aggravated by military service,“ a bench of justices T S Thakur and R Banumathi said. The court said it would be presumed that the soldier contracted the disease because of his job and it is for the government to prove that the disability is not attributable to military service. “This necessarily implies that no sooner a member of the force is discharged on medical grounds, his entitlement to claim disability pension will arise unless, of course, the employer is in a position to rebut the presumption that the disability which he suffered was neither attributable to nor aggravated by military service,“ it said. The court said the provision of disability pension is a beneficial provision which should be interpreted liberally so that armed force personnel discharged because of disease are benefitted. “There may indeed be cases where the disease was wholly unrelated to military service. But in order that denial of disability pension can be justified on that ground, it must be affirmatively proved that the disease had nothing to do with such service. The burden to establish such a disconnect would lie heavily upon the employer. Otherwise, the rules raise a presumption that the deterioration in the health of the member of the service is on account of military service or aggravated by it,“ the court said. The court passed the order on a petition by the Centre challenging an Armed Forces Tribunal order directing it to pay pension to some ex-soldiers who were discharged from military service. One Rank, One Pension’ a Reality Soon? Further to the information given in the report of rally held on 1 Feb 15. On 1 Feb 15 a delegation of 30 ESM including four veernaris met RM at Kotah house. RM had promised to take action on OROP latest by 17 Feb 15. IESM has a good news for you. Your dream of OROP has moved a step closer to its approval. As promised by RM to IESM delegation that he will personally monitor the progress on OROP. True to his promise he has chaired a meeting today of OROP action committee. The meeting was attended by CGDA,DESW, MOD and Army pay cell Maj Gen Aggarwal and Col Pruthi. Col Rathore also attended the meeting. It is confirmed that OROP file has finally reached MOD. Following decisions have been taken in the meeting today 17 Feb 15. OROP will be as per approved definition. In most of cases ESM will get fixed at highest of their rank pay band. OROP equalization will be done annually. Some issues of Major's pension are under discussion and will be sorted out soon. RM gave special instructions to Gen Aggarwal to inform Gen Satbir singh about this development. Gen Aggarwal informed IESM asap he came out of the meeting. File is under final scrutiny and preparation and file will be dispatched to MOF on 23 Feb as RM is going to attend Annual Aero Show at Bangaluru from 17 to 22 Feb.
CGDA has already issued circular no 536 giving increase in pension of widows w.e.f. 24 Sep 12. This circular fixes the pension of widow at 60% of the pension of the ESM as given in circular 500. Widows will get this enhanced pension from 24 Sep 2012. They will further get arrears from 1 Jan 2006 as and when the MOD issues such instructions. Dear Members hold your celebration till budget. We will finally come to know how much funds get allotted for OROP in this years budget and will raise a toast for OROP on that day. IESM salutes sincerity of RM Sh Manohar Parrikar. He is a man of his words. He had promised action on OROP by 17 Feb and he has executed it. New Delhi: Aiming to fulfill a long-standing demand of ex-servicemen regarding the implementation of 'one rank, one pension' norm, the government may categorise 'military pension' as a different pension category. Official sources said that is likely that military pension may be soon categorised as a separate category which would ensure that it cannot be equated with other pensions. "There are several reasons because of which the government is contemplating such a move to differentiate this service. First of all this is the only service where a majority of soldiers retire at the age of 34 years. There is constant risk to life and the service hours are round the clock," a well placed source said. Explaining the logic further, the source said that military is also the last line of defence and such a step will also have a motivational and inspirational value. Sources said that the Finance ministry and the Defence Ministry are making efforts towards fulfilling the commitment. It is learnt that the Finance Minister Arun Jaitley and Defence Minister Manohar Parrikar have been deliberating on the issue. The move is expected to cost around Rs 8,000 crore, the sources said. "Detailed planning is required as there are hundreds of ranks and thousands of permutations and combinations involved," a source said. One rank, one pension scheme has been a long-standing demand of the over 2 million ex-servicemen in the country. Reference: This Office Circular No. 502 dated 17th January 2013 [Click here]. A copy of corrigendum of Government of India, Ministry of Defence letter No.1 (14)/2012/D (Pen/Policy) dated 25th November 2014 on the above subject is forwarded herewith for information and necessary action, which is self-explanatory. 2. The rates of Enhanced rate of Ordinary Family Pension have already been circulated vide this office circular no 502 dated 17th January 2013. However, the provision for Enhanced rate of Ordinary Family Pension could not be reflected in Para 3 of the MoD letter No.1 (14)/2012/D (Pen/Policy) dated 17th Jan 2013 [Click here]. Therefore the same has been amended vide Government of India, Ministry of Defence corrigendum referred to in Para 1. 3. Further, some columns of GoI, MoD letter No.1 (14)/2012/D (Pen/Policy) dated 17th Jan 2013 [Click here] which need correction, addition and deletion have also been amended vide Government of India, Ministry of Defence, corrigendum mentioned above. immediate implementation of the government orders to revise the pension w.e.f 24.09.2012. Subject:- Implementation of Government decision on the recommendations of the Committee of Secretaries 2012 on the issues related to Defence Service Personnel and Ex-Servicemen - Enhancement of Ordinary Family Pension in respect of pre- 2006 JCO/OR family pensioners. Similarly, the minimum guaranteed enhanced rate of ordinary family pension in respect of family members of pre-2006 JCO/ORs including honorary Commissioned Officers and Non-Combatants (Enrolled) of Army, Navy. Air Force, DSC 8: TA, shall be determined as 50% of the minimum of the fitment table for the rank in the revised pay band as indicated under fitment tables annexed with SAI/1/8/2008 as amended and equivalent instructions for Navy & Air Force, plus the grade pay corresponding to the pre-revised scale from which the pensioner had retired discharged / invalided out/ died including Military Service Pay and 'X' Group Pay, wherever applicable."